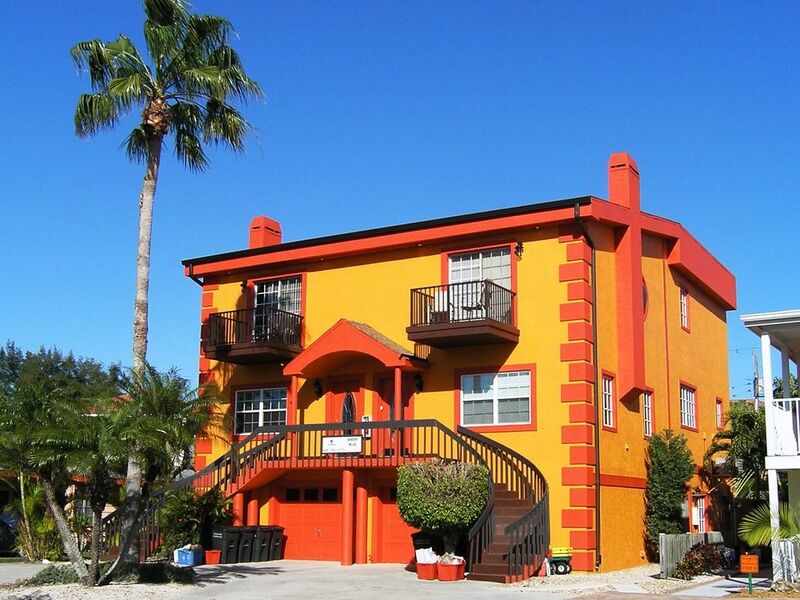 SEASIDE VILLAS: This Siesta Key deluxe 3-Bedroom townhouse rental is located in the heart of Siesta Village - just steps to all the shops and restaurants and only a three minute walk to world famous Siesta Key Crescent Beach! Siesta Village has dozens of shops, fine or casual dining, pubs and clubs, shopping, and more, placing this property in one of the most sought after locations on Siesta Key. This Siesta Key 3BR vacation rental is well equipped with amenities rarely found in a Siesta Key vacation rental - everything you need to make your stay memorable. This Siesta Key vacation rental has an in-ground, serpentine, 14 by 26 feet, private heated pool (for Seaside Villas guests only). Tropical landscaping, a gas grill, and patio furniture complete this vacation paradise pool area. For your time on Siesta Key's nearby powder white sand beach (a block and half away), we have provided coolers, beach chairs, beach towels and wagons with sand tires for your convenience. We also provide free WiFi access. Seaside Villas consists of (2) three-bedroom units and (2) one-bedroom units. Larger groups can rent up to eight bedrooms (accommodating up to 20 guests), all in the same building! The spacious three bedroom - with 2 ½ baths - Siesta Key townhouse is spread out over two levels and has more than 1900 square feet of living space. The main level is airy and bright with lots of windows and contains a huge living room, dining room and kitchen. The living room has a couch, love seat and accent chair, 55+" flat panel LCD HDTV, DVD player and a marble fireplace. The dining room with modern tile flooring is also very large with table and chairs, plus counter seating for 8-10, and a highchair. The large updated island kitchen is modern and well equipped. Tile floors, granite countertops with tumbled marble backsplash, a full suite of stainless appliances, and drop-in glass range on the island make this a favorite gathering spot. The main level also has a half bath and washer/dryer. Located in a highly desirable location - right in Siesta Key Village and only a block and a half from world famous Crescent Beach!. Activities (on site or nearby): biking, golf, tennis, basketball, fitness center, shuffleboard, horseshoes, miniature golf, amusement parks, fishing, wildlife viewing, shopping, restaurants, live theater, cinemas, museums, sightseeing, swimming, snorkeling/diving, boating, sailing, water skiing, surfing, windsurfing, parasailing, jet skiing, shelling. Please contact owner for further information about additional units & rates!